Brampton Churchyard had been in constant use for internments since Norman times but on 31st December 1882 the Council decided that there was no more room in the Churchyard and it was closed to further burials. Land, adjacent to the East of Churchyard, was bought by the Council as the Parish Cemetery in 1883 and this was to be administered jointly by the Rural District and the Parish Councils. At about the same time a local man, Mr A. J. Allen, purchased a Hand Drawn Hearse and erected a building to house the vehicle in Brampton. The Hearse was donated to the Parish Council for use during funerals and although initially used quite extensively, it fell into disuse in the middle of the 20th Century. The Parish Council decided that rather than dispose of the hearse it would be offered on loan to the Norris Museum, St Ives, to be displayed so that the general public could understand how coffins were transported to the cemetery in the past. 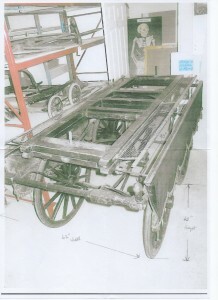 However, after some time the hearse was removed from public display and was consigned to the storage room at the museum. In 2012, the museum was reviewing its exhibits and articles in storage and deciding that the hearse was no-longer a suitable exhibit they requested the Brampton Parish Council remove the hearse and take charge of its further storage. In December 2014 the hearse was disassembled and moved into storage at a local farmer’s barn. In the same month a chance meeting between Councillor Mrs Maureen Wigley, Brampton Burial Clerk, and the Huntingdon Co-op Funerals Office she noticed they had a number of pictures of old and modern hearses but no picture of a hand drawn hearse. 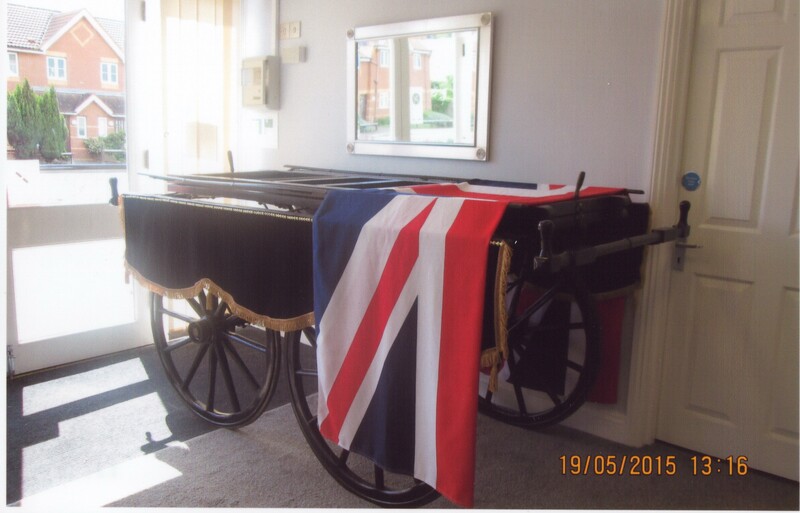 After some discussion between Mr Brendan Smith, Director of the Huntingdon Anglia Co-op Funeral Office and members of the Brampton Parish Council it was agreed that the hearse would be loaned to the Funeral Office to be displayed. Sadly the Hand Drawn Hearse had fallen into some disrepair so it was agreed that it should be renovated before being displayed. Fortunately a friend of Mr Smith’s was willing to take on renovation task. Having completed the work, the hearse in its resplendent black lacquered finish and new cloth side panels was put on display at the Huntingdon Anglia Co-operative Funeral Office, St Peters Road on Saturday 23rd May 2015. The hearse will stay at the Co-operative Funeral Office for the foreseeable future.